I had a Visa gift card for $50.00 that I received as a Christmas gift. I was poking around on Amazon, and it’s unusual that I can’t find anything on there that that I want, so I decided to look around my bookmarks on my web browser to check out other merchants. I saw one for Darn Good Yarn. Hmmmm, I haven’t bought cool yarn in a while, I said to myself. I opened the page. With $4 for the economy shipping, I received my package in a few days, and set off winding the three that were in hanks, and got to work. I’m going to change gears slightly now and tell you a little bit about Darn Good Yarn. They employ women from India and Nepal to make their yarns, giving these women a good living wage and selling their products at a reasonable rate. This is basically what fair trade is. In addition to this, a lot of the yarn is recycled, mostly from saris, which are those brightly wrapped dresses that a lot of people in Nepal and India wear. You can read more about this idea on the Our Story page. I adore fair trade. There’s an awesome fair trade store called Ten Thousand Villages in my area that I sometimes go to. I also have a dress and a skirt made from recycled saris, too. DYG’s product and philosophy sucked me right in. Yes! Let’s get to the yarns! At the Bahamas was the first skein I sunk into. I got a pattern for a one skein sari scarf that I found on DGY’s site, and started to work. I had the needles it called for, and now I had the yarn, so I went ahead and started knitting. The yarn sections are knotted and sewn together, so they are really fastened well. Don’t worry about the knots, as I think it gives a nice texture. The colors are fun, too! I have finished this scarf, and am wearing when I go outside now. It’s a great length to wrap around with! Only drawback: it does have a slight odor to it. It’s not bad, but it’s strange. I’ll have to have the scarf dry cleaned to remove the smell. No biggie, though. This is a worsted weight yarn that comes in a ball. It’s got slubs, thick and thin parts, and lots of fun texture. I really like it. It takes the fun fur concept and makes it sophisticated. I knit a scarf out of it on small-ish gauge needles ( I think US 4), and cast on 15 stitches. I used seed stitch until I had only enough yarn to bind off. All I have to do is weave it the ends! This yarn is a little frustrating work with at times. I did have a spun join break once, and only once. I just reattached the yarn and kept on going. It also has a tendency to curl back into itself like it’s overspun, which is part of the charm of the yarn, really. Just an FYI. The Blender is probably the least favorite, but I still like it. The skein makes one short scarf on big needles. I intend to sew the two ends together and make a really cool cowl. I think this yarn would be fantastic for arm knitters! Oooh, and maybe a few skeins together would make a really funky shopping bag, too. Ah, the last gem in the pack. Pun intended, of course. I like Tibet Jewels! The colors and the fuzzy textures make nice contrasts. Again, this is a recycled sari yarn complete with knots that are reinforced with machine sewing. You will be fine. When I knit the scarf, the skein again rendered a scarf that is really short, so I’m going to sew the ends together to make a cowl. Think how those colors would look against a black shirt! That’s my review of DGY’s Holi pack. 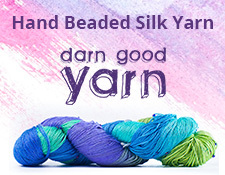 It’s a great bargain and you get some fun yarn to play with. You really do! There’s tons of cool stuff on their site besides yarn. There’s ready made jewelry and clothing, as well as beads to make your own projects, too. It’s really worth your time to check them out. You’ll be helping women, helping the earth, and helping augment your yarn stash. It’s a win-win-win! Posted on January 19, 2017 January 19, 2017 by jennabee25Posted in RamblingsTagged best of dgy packs, darn good yarn, dgy, fair trade, holi pack, knitting, recycled yarn, sari yarn, ten thousand villages. Previous Previous post: Look How We’ve Grown!